Sitting in pre-Apocalypse, pre-Christmas crush and stress, I caught sight of smoke signals. Maybe even heard the drums, growing louder, moving closer. As the darkest day approached and enveloped us all, as scintillating Solstice prophesy and declarations swirled, I clicked on through, and opened this. The drums, the singing, the dance, the people, the immense ancestral, traditional, indigenous power of it all – woke me from slumber, as it has indeed awakened and given rise to countless others who are Idle No More. I put that and other Round Dance Flash Mob videos on repeat – immersed in them like hot springs, inviting the energy, and the joyously invigorating dead serious message. After generations of genocide, political slight-of-hand, segregation and degradation, after being tossed empty words and shoved with broken promises, broken homes, broken lives, suicides, dead food and contaminated water – thousands upon thousands of indigenous people are gathering in cities, towns, villages, malls, plazas, galleries, roads and railways across Canada, the US – all around the planet – to dance, sing and stand up for human rights and human decency, to support Chief Theresa Spence in her ongoing hunger strike, to stop Bill C-45, a Bill pushed through in early December that cut 2.5 million protected waterways in Canada down to 97 (!) and to say, loudly, furiously; enough is enough. 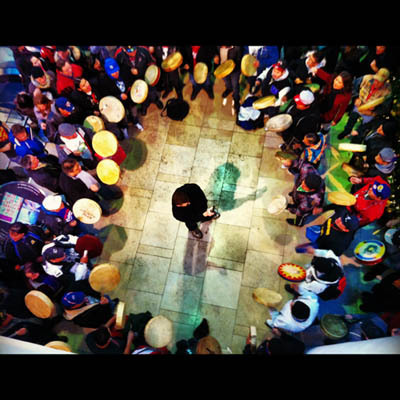 On December 22, 2012, myself and friends rushed to TD Square, a major shopping mall in downtown Calgary, to participate in the Round Dance Flash Mob – it was one of the most inspiring and moving experiences of my life. Here’s the video . Originating from the healing dances of the Plains Indians, the Round Dance is a dance of joy and happiness, kinship and harmony. It has developed into a friendship dance that has long been held as a courting activity. The Round Dance – its spirit, purpose, and presence – makes Idle No More all the more profound; multi-dimensional, international,and boundary dissolving. Thousands of people as one; creating, teaching, sharing, dancing, singing and in sync with the heartbeat of a movement marching above and beyond colonialism, capitalism and racism – overwhelmingly and courageously speaking up and moving forward for indigenous rights and sovereignty, human rights and decency, and the health and stewardship of this planet and its peoples. “This is people saying we believe our future is at stake, that if we don’t act now, [aboriginals] will be taken off the map,” – Tanya Kappo, Idle No More founder. And it is “not just an Indian thing“, not just a Canadian thing. Idle No More is a movement, it is a force and a way of life that any sane, conscious person should engage. Consider that Idle No More is, perhaps, one of the last lines of defence before Stephen Harper’s Conservative Government, along with numerous corporations, push ever more sickening, massive development across the land, dismantle all but token environmental protections, attack and extinguish Treaties, disregard and violate UN Conventions, for example this, and essentially turn this country, this sacred landscape, into toxic Open Pits and Tar Sands. This open letter from Amnesty International spells it out in full. Klein’s excellent article for the Globe and Mail succinctly maps the vast, complex details that fuel Idle No More. ” … the time for bitching and moaning is over. Now is the time to act, to stand strong and unbending for the people, places and principles that we love. 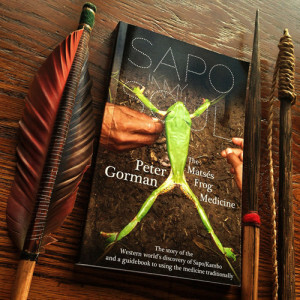 … the Idle No More movement – its name at once a firm commitment to the future, while at the same time a gentle self-criticism of the past. We did sit idly by, but no more. Idle No More is spreading like hurricane wildfire throughout the world. Canada, USA, Europe, Australia, Egypt, Palestine, Colombia… the list goes on. This Google Map charts the first 200 rallies, flash mobs, blockades, teach-ins, and solidarity messages across the planet. Google only allows 200 markers to appear. There are many, many more events taking place. Keep watch, keep dancing, keep the fire.